Liquid water seems simple, but there’s a lot of chemistry going on in it. It is common knowledge that, in pure water, under ordinary conditions, 1 in every 10 million H2O molecules is dissociated into the acid ion H+ and the base ion OH–. However, what preference, if any, these self-ions of water have to sit at the air water interface has been the subject of lengthy and heated debate. The question is consequential in a wide range of contexts, including on the surface of droplets in the atmosphere and at the surfaces of biomolecules. The Herzfeld group has now bridged the gap between experiment and theory by using a model that efficiently balances three subtle features of water molecules (polarizability, H+ sharing, and H+ transfer) that control the ambient behavior of the liquid. The model predicts that OH– prefers the air-water interface while H+ avoids it, consistent with observations of the response of air bubbles in water to an applied electric field. Bai C, Herzfeld J. Surface Propensities of the Self-Ions of Water. ACS Central Science. 2016. Judith Herzfeld, Professor of Biophysical Chemistry at Brandeis University, has been elected as a 2013 Fellow of the Massachusetts Academy of Sciences. Herzfeld will join Brandeis professors Carolyn Cohen, Irving Epstein, Jeffrey Hall, and Eve Marder as Fellows of this academy. 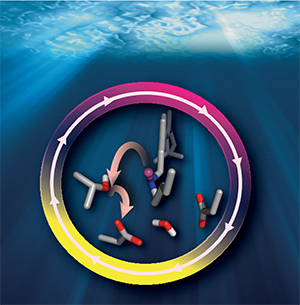 Herzfeld’s lab at Brandeis has solid-state NMR and the development of force fields for molecular simulations as its most recent foci of research. Professor Herzfeld also has a longstanding involvement in developing new methods for teaching chemistry. Whereas the diffusion of water molecules in the bulk liquid depends entirely on breaking hydrogen bonds, the diffusion of proton defects (i.e., an excess proton in acid or a proton deficit in base) is expedited by proton hopping across hydrogen bonds. The details of this process are well understood in acid, and the process in base was believed to occur in analogous fashion. However, theoretical studies of hydroxide have given highly divergent predictions of solvation structures and diffusion rates, depending on the chosen recipe for such simulations: some predicted the traditionally expected solvation structures and some predicted the experimentally observed diffusion trends, but none do both. Now Seyit Kale, a graduate student in Prof. Judith Herzfeld’s group, has studied proton defects using the group’s recently developed LEWIS force field. 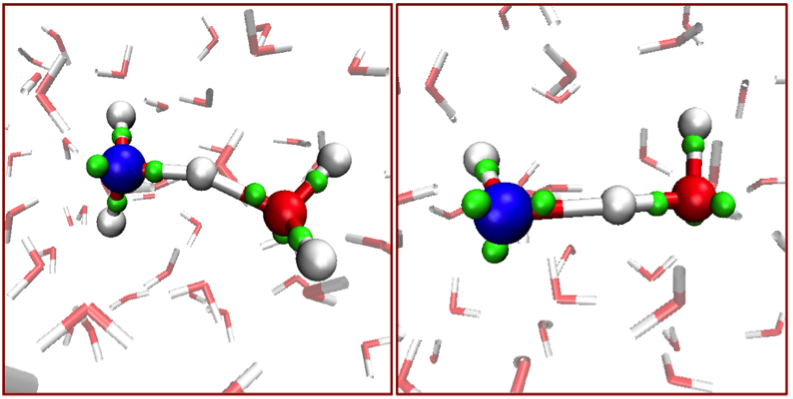 The LEWIS simulations obtain the correct relative diffusion rates with hydroxide solvation structures that are analogous to those of hydronium, thereby supporting the traditional picture of the “proton hole”. The authors also catch and characterize proton transfer events, identifying similar “special pairs” as the intermediates in both cases (see figure). S. Kale, J. Herzfeld, J. Chem. Phys. 2012, 136, 084109. S. Kale, J. Herzfeld, Angew. Chem. Int. Edit. 2012 in press. DOI: 10.1002/anie.201203568. O. Markovitch, H. Chen, S. Izvekov, F. Paesani, G. A. Voth, N. Agmon, J. Phys. Chem. B. 2008, 112, 9456-9466. There is a common notion that “If Nature can find a use for something, She will.” and this story has been gradually playing out for the cross-beta protein fold. Known generally as “amyloid”, the cross-beta fold was first identified in pathologies including neurodegenerative disorders such as Alzheimer’s and systemic amyloidoses such as amyotrophic lateral sclerosis (often referred to as “Lou Gehrig’s Disease”). 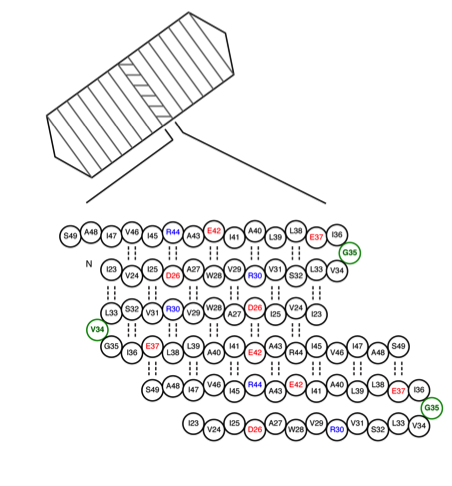 This happenstance initially pegged the fold as a feature unique to abnormal proteins. However, it subsequently became clear that normal proteins subjected to abnormal conditions would also assume the cross-beta fold. Still, it seemed that the fold was a sign of proteins gone awry. Then came discoveries of cross-beta folds in native, functional proteins. Some are primarily extracellular bacterial proteins involved in negotiating air-water interfaces at sporulation. But some involve the intracellular packaging of proteins in humans. Now Brandeis investigators Eugenio Daviso, Marina Belenky and Judith Herzfeld, with MIT collaborators Marvin Bayro and Robert Griffin, have found that an entire organelle is assembled with the cross-beta fold.1 Gas vesicles, the pressure-resistant floatation organelles of aquatic micro-organisms, comprise a protein-encased gas bubble. Assembly and disassembly of these bodies allows the cells to navigate up and down the water column and the cross-beta fold of the protein shell lends the vesicles the strength and interfacial stability that is critical for their function. 1. Bayro M, Daviso E, Belenky M, Griffin RG and Herzfeld J*. An Amyloid Organelle: Solid State NMR Evidence for Cross-Beta Assembly of Gas Vesicles. J. Biol. Chem., DOI 10.1074/jbc.M111.313049. 2. Blaurock AE and Walsby AE (1976) Crystalline structure of the gas vesicle wall from Anabaena flos-aquae, J. Mol. Biol. 105, 183-199. Magnetic resonance is a powerful tool for interrogating materials at the atomic level, whether in determining protein structures or imaging the body. The procedure entails measuring the dynamics of the magnetism after it has been perturbed by radio waves. Usually the evolution is sampled at equal intervals, which is straightforward over one evolution period. However, experiments increasingly involve transfers of magnetization between different groups of atoms and require measurements after each transfer. In such experiments, it can become overwhelming to sample all the points in each evolution period, from the early ones needed because they have the strongest signal, to the late points needed because they provide the resolution of different contributions. Therefore, much recent attention has been given to finding ways to sample non-uniformly. This work led to a consensus that if one drops points it is necessary to do so randomly to minimize artifacts. The problem is that one can randomly get a very bad sampling schedule and waste a whole experiment (worse yet without necessarily knowing that the sampling schedule is the problem). Now, a MIT-Brandeis team1 has shown that non-uniform sampling need not be random and that adhering closely to a suitable distribution function produces high quality results. 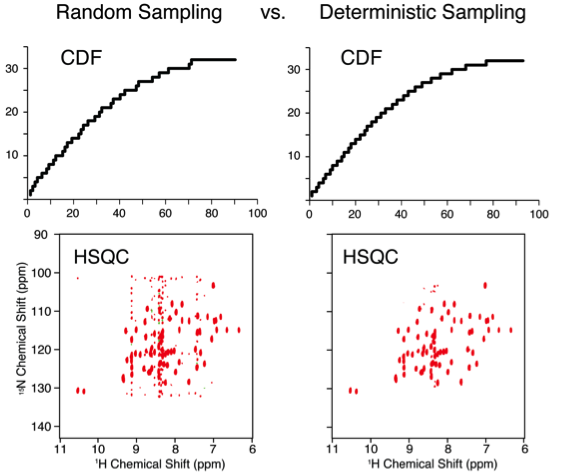 An example of cumulative distribution functions (top) and results (bottom) for non-random sampling (right) compared with random sampling (left).